John Henderson Duffus Bsc, PhD, Dsc, Cchem, FRSC, Cbiol, MIBiol. -Chemicals in occupational health and environmental health toxicity of chemicals in the natural environment. - Education - especially methods of facilitating self learning curriculum design. - Design and presentation of course content. After a school career completed as Dux of Arbroath High School with school medals in English, Greek, Maths and Science, I opted to study Biochemistry at the University of Edinburgh. In 1959, I was awarded one of 4 Keasbey Memorial Bursaries for academic excellence. I graduated with BSc honours in Biochemistry in 1962 and went on to obtain my PhD in July 1965. In 1967, after a period as Research Fellow at the University of Warwick, I came to the University of Edinburgh Department of Zoology to work on the cell cycle with Professor Murdoch Mitchison. I remained at the University of Edinburgh until 1970 when I obtained a Lectureship at The Heriot-Watt University. Initially I continued my research on the cell cycle and developed a hypothesis concerning the role of magnesium in control of cell division based on observations of the large flux that occurs at the time of division. My work on the cell cycle and other biological control systems was supported by a series of grants from the Science Research Council and was recognised by the award of the degree of DSc by Heriot-Watt University in 1981. In 1973, I was asked to advise on prevention of toxic hazards for fish and human consumers from possible discharge of metals near fishing grounds. This led to increasing involvement in environmental toxicology and I developed a course for our students and wrote the textbook, "Environmental Toxicology". Favourable comment on the book brought me to the attention of the World Health Organiza- tion Regional Office for Europe and I became their main consultant on Manpower Development in Toxicology under the International Programme on Chemical Safety (IPCS). Further consultancies on this and on other aspects of chemical safety followed together with involvement in overseas programmes (with UNDP, UNEP, ILO, IRPTC etc. ), especially in South East Asia - India, Thailand, and Indonesia, but also in Africa, Mexico, South America and the USSR. Nineteen ninety-two saw the publication of IPCS Training Module No. 1, the beginning of a modular teaching programme which I started developing for WHO in 1980. This module established the ground plan for succeeding modules as part of target curricula for toxicologists and environmental health personnel. In addition, my textbooks on toxicology and other subjects have now been translated into Bahasa Malaysia, Polish, Portuguese, Russian and Spanish. Some of the World Health Organization work has been in collaboration with the European Commission (EC) and I have just completed my third contract with EC Directorate General V on 'Assessment of Carcinogenicity of Industrial and Other Chemicals'. I was also responsible for organizing, with DGV and Eurometaux, the "International Seminar on Assessment of Carcinogenic Risk from Occupational Exposure to Inorganic substances" held in Luxembourg in October 1995. In 1989, in response to growing demand for work on toxicological problems, the Edinburgh Centre for Toxicology was founded with myself as Director and EC Contracts and my other activities are carried out through the Centre. The Centre has a small core of personnel and operates by putting together task groups for problems as they are presented. Because of my background, relating metals to fundamental biochemical processes, and that of chief medical consultant, Dr Draper, relating to physiological handling of metals, in addition to the chemical expertise of my deputy, Dr Park, we are particularly interested in problems related to inorganic substances and metal compounds. I am a founder member of the Royal Society of Chemistry Toxicology Group, former chairman of the group, and now a member of the RSC Committee on Environment, Health and Safety and Vice Chairman of the Special Projects Core Committee. I was elected in 1991 as a Titular Member of The Commission on Toxicology of the International Union of Pure and Applied Chemistry and I am the United Kingdom representative on the Commission. I chaired the IUPAC Working Party preparing a Glossary for Chemists of Terms Used in Toxicology published in 1993. I am currently a member of the United Kingdom Department of the Environment 'Advisory Committee on Hazardous Substances' and the Department of Health 'Health Advisory Group on Chemical Contamination Incidents'. I have contributed to the European Science Foundation Working Group on "Economic Analysis in Environmental Toxicology". I was a member of the WHO Task Force which prepared background documents for the Second European Conference on Environment and Health held in Helsinkiin June 1994. I am currently preparing a course on 'Risk Assessment' for the United Nations Environment Programme International Register of Potentially Toxic Substances. I have authored or contributed significantly to 126 major publications and received extensive financial support from UK Research Councils, the Commission of the European Communities, and other national and international organizations such as IPCS, UNEP and IRPTC. Dr. David Duffus believes whale watching will change your life. Observing a beast so enormous yet graceful enough to slide under a boat with only a ripple in its wake is an awe inspiring experience. Face to face experiences such as this will hopefully lead to an appreciation of the existing balance between humans and nature. Research in the field of marine mammals seeks to set aside the old order of scientific exploration that has humans relegated to a peripheral position. Dr. Duffus endeavours to understand the multifaceted relationship between wildlife and humans on a first hand basis that places the scientist close to nature; close enough to count a killer whale's teeth as it breaks the surface. Scientific observation of marine wildlife helps build ecological foundations for wildlife conservation efforts. With an understanding of how humanity affects the wild, new directions in conservation, institutional arrangements, development issues, wildlife use and management, and scientific-ethical questions can be opened up for questioning. The core of marine mammal research at the University of Victoria is found at the Department of Geography. Working with various research associates, colleagues, and talented graduate students, Dr. Duffus has been able to put forward a number of research projects. To say the least, UVic research has grown in strength and gained a good measure of respect in the marine mammal community. Research on marine mammal ecology and conservation extends across innovative projects on grey whale feeding ecology, harbour porpoise conservation and the ethics of whales in captivity. Dr. Duffus has been researching the grey whale feeding ecology project in Clayoquot Sound on the west coast of Vancouver Island for over 4 years. He has been aided by 3 graduate students, a number of research associates and hopes to involve the local native community in the research process. Dr. Duffus has led a pioneering effort in grey whale feeding pattern research by employing the time depth recorder to his analysis. This harmless recorder has a computer control that is temporarily attached to the grey whale by means of a suction cup. The research goal is to establish a data base of grey whale feeding behaviour to be used in testing the applicability of optimal foraging theory to large marine mammals. Behaviour patterns are established by intensive analysis of spatial and respiratory behaviour. This database of knowledge can then be applied to studies that research the effects of recreational whale watching vessels on grey whale behaviour. The results will provide foundations for the management of whale watching and protected management for whales in the Clayoquot Sound area. When people are brought into a close but managed encounter with marine life they can learn to respect the environment while they enjoy the beauty of their surroundings. The ecological balance between human activity and marine life is difficult to assess. For example, while harbour porpoises are declared an endangered species on the east coast of North America, there is no empirical data on these west coast cetaceans to formulate any kind of conservation opinion. In collaboration with the Marine Mammal Research Group and the Stranding Network, Dr. Duffus hopes to discover if there is any correlation between the rise of porpoise deaths in local waters and anthropogenic effluents. Dr. Duffus and his associates have been applying the methods of gross pathology and toxicology in a systematic sampling of heavy metal and organo chlorine deposits in harbour porpoises. It is clear that these creatures are taking the brunt of increasing pollution; the goal is the difficult task of assessing the damage. What is known for sure though is that cetaceans are slow to recolonize. Evidence of this is found in the waters off Nanaimo B.C. that have been relatively vacant of whales since the whaling station was booming there in the 1850's. Putting into effect the methods of both natural and social sciences is Linda Sheehan, a geography graduate student of Dr. Duffus. Human Dimensions of Cetaceans in Captivity is the name of the project that applies qualitative analysis of public opinion on whale captivity. The focus of the project is to try and understand the benefit that people obtain from seeing captive displays and compare that to what facilities propose to provide. Traditional polling methods are often ambiguous and only offer rhetorical responses to questionnaires. Sheehan uses in-depth and intensive interviews with employees of the Vancouver Aquarium and members of the public in her progressive research on the human dimension. This type of study makes people think twice about the views they hold, and it promotes ideas on conservation. Elsewhere in the Department of Geography, ongoing and proposed research interests of Dr. P. Keller focus on the advancement of geographic information analysis and management techniques to better facilitate regional planning, resource management and decision making. Research projects include investigation into temporal dynamics in spatial analysis, marine Geographical Information Systems (GIS), design of innovative interpolation techniques to facilitate thematic surface modeling, investigation of uncertainty in natural resource data, the integration of GIS in tourism planning, the study of GIS management strategies and issues of spatial data access. Dr. David Duffus leads a team of researchers focusing on several aspects of marine mammal ecology.Field work concentrates on gathering basic data about grey and killer whale feeding patterns. Surface observations, supplemented with bottom sampling and other data gathering techniques have yielded a considerable amount of basic data regarding behaviour. Utilizing many years of accumulated field data, spatial analysis of the results have led to new insights into feeding ecology. Parallel research into human-whale interactions and disturbance have also yielded considerable data. Graduate students have examined the philosophical, biogeographical, and the tourism aspects of the rapidly growing industry of "whale watching". 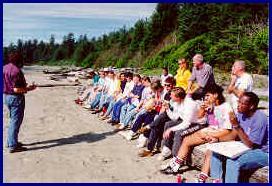 Students enjoy lunch on the beach in Pacific Rim National Park while listening to a talk by the University of Victoria's Dr. Dave Duffus on marine geography. The Whale Reseach Lab at the University of Victoria consists of a small group of graduate students, interested faculty, associates and visitors from a number of places. We have grown from a small field research-based group, begun in the late 1980's by Dave Duffus and Phil Dearden. Their early studies on whales and whale-watching around Vancouver Island have evolved into a number of linked studies of whales and people in several sites. Both Duffus and Dearden acknowledge the large number of talented and determined field researchers and students that have kept us involved in field sites from Clayoquot Sound, British Columbia, to the Mekong River, South East Asia, and in human relationships with marine wildlife to toxicology studies. Our approach to marine mammal research is a little unusual, beginning with our presence in a geography department. At the core, our interest is conservation, and within the spectrum of things that conservation can mean, ours lies on the side of protecting the animals and their environment, rather than the "wise use" dictum currently vogue by industrial resource users. The studies we have participated in range from ecology to socio-historical traditions, and the methods from counting and weighing pelagic crab larvae to "in-depth" interviews with aboriginal people about the history of fur sealing. geography collegues. We are developing research projects using landscape ecology traditions with new linkages to researchers from a number of other universities. The management work that we began early on in also a continuing effort through a number of projects. As whale-watching grows around the globe we are continuing studies and action to work towards maximizing conservation benefit and minimizing disruption to the animals and habitat. Links to detailed descriptions of our present projects can be found below. Communications and dialogue are also principal interests of ours. In the past few years we have participated in, and developed several workshops, at both the local and international scale. MARMAM, the sometimes controversial discussion list, originates here, begun as the brainchild of Dr. Robin Baird, before the WEB and Internet were in everyday use. community and region, and from friends and associates far afield. As whale watching increases in popularity on a global scale we are beginning to realise that our knowledge of the cetaceans involved is not increasing on a similar scale. We find ourselves increasingly in the realm of uncertainty, yet economic pressures, or lack of knowledge itself, are often used as reasons to override implementation of precautionary approach techniques in whale-watching management. The University of Victoria Whale Research Lab has been examining the growth of whale-watching in British Columbia since 1988, from its austere beginnings in the early 1980's, to the important industry it has become in the province today. However, along with this growth have come the problems like that mentioned above. Having participated in previous workshops and meetings regarding whale-watching, and finding ourselves involved again in this issue, we decided in the fall of 1997 that it was time again to bring together a group of concerned people. On January 18th, 1998, during the World Marine Mammal Science Conference, in Monaco, we therefore held a workshop on whale-watching research. Our intention was to explore and discuss some of the most recent research focused on cetacean populations subject to recreational whale-watching. As a jumping-off point, we revisited the "Making Decisions about Whale-Watching Rules" framework, developed by Steve Leatherwood at the Montecastello, Italy, workshop, held in 1995. In memory of Steve, we christened the framework the "Leatherwood Principle," the principle being hypothetical science as a foundation for decision-making. We invited five researchers from various locations around the world to address in detail the ecologic, socio-economic, and research status of each of their situations. Pitched battles with slide projectors and VCRs ensued. Discussion of the particular situations followed each presentation. During the second half of the day an open discussion took place. The discussion allowed for both experienced and inexperienced researchers to exchange ideas and develop a dialogue focussing on important issues. discussion session, as well as email and web links to the presenters and chairs. We welcome comments and recommendations on the report. Notarbartolo di Sciara, who consulted with us on the workshop program and moderated the open discussion session, Holly Arnold, Robin Baird, Rochelle Constantine, Pete Corkeron, Dave Duffus and Ben Wilson, who spent a lot of time preparing presentations (and standing up in front presenting! ), Christina Tombach, for running the registration desk (at 8:00 am! ), and Anna Bass, Christina Tombach and Jason Dunham for recording the discussion session. Dr. David Duffus leads a team of researchers focusing on several aspects of marine mammal ecology. Field work concentrates on gathering basic data about grey and killer whale feeding patterns. Surface observations, supplemented with bottom sampling and other data gathering techniques have yielded a considerable amount of basic data regarding behaviour. Utilizing many years of accumulated field data, spatial analysis of the results have led to new insights into feeding ecology. rapidly growing industry of "whale watching". Doctor of Philosophy in Marketing, Purdue University, West Lafayette, IN, December 1979. Master of Science in Industrial Administration, Purdue University, West Lafayette, IN, 1969. Bachelor of Science in Mechanical Engineering, Pratt Institute, New York City, NY, 1968. Over 12 years as a member of the marketing faculty (undergraduate and graduate) at the University of South Florida at Fort Myers (1985-97). Courses taught include: Undergraduate - Marketing Principles, Marketing Management, International Marketing, Marketing Opportunity Analysis, Sales Management, Promotions Management, Business Policy and Marketing Research. Graduate - Marketing Management, Marketing Research, International Marketing and Marketing Strategy and Decision-Making. Recent scholarship reflects a mix of interests, embracing international marketing management, outcome-related issues among at risk students in the public schools, and economic development of minority communities. Scholarly work has been disseminated in a range of local, regional and national publications. In recent years, the research focus has been on creating a peer culture of success among "at risk" public school students. Founder and Publisher of PSEP News, a bi-annual newsletter to the business and donor communities of southwest Florida. Chairman, USF - Fort Myers, Faculty Council, 1993-94. Founded the PSEP Research Council, which during its first year, 1998-99 will award faculty research grants totaling $10,000. Co-Chair, 27th World Congress for Small Business, Knoxville, Tennessee, 1982. Raised in excess of $90,000 per year from local grants and other solicitations during last 5 years. Generate over 100 paid Summer Internship opportunities each year for Scholars’ Club students enrolled in the public school systems of Southwest Florida. Over 11 years as a top-level administrator in a major multi-national firm (Esso Inter-America, Inc.). Extensive management, budgetary, sales and strategic planning experience. Founded, and managed various small businesses, one with sales of over $2,000,000 and a staff of 60. Founder and Editor, Southwest Florida Business Outlook, 1992. A research publication. Distinguished Leadership Award, 1977, Sprint and the Chamber of Southwest Florida. Distinguished Service Award Nominee, 1997, College of Business, University of South Florida. Outstanding Post Secondary Educator (1994-95), Phi Delta Kappa, Lee County, Florida. Ida Baker Distinguished Minority Educator (1991, 1993), University of South Florida. Coach of a Gold Medal Tennessee select soccer team (under 13), 1984 McDonald’s Youth Soccer Olympics. Recognized as a "Tennessee Olympian" by the University of Tennessee, Knoxville for this achievement. Numerous civic and community awards. National Youth Soccer Coach Trainer, American Youth Soccer Association, 1980-83. Associate Professor of Marketing, University of South Florida, Fort Myers Campus, Fort Myers, Florida (Tenured), June 1985 to present. Visiting Professor of Marketing, University of the West Indies, Mona, Jamaica, April 1995. September 1979 to May 1985 - Assistant Professor of Marketing, The University of Tennessee, Knoxville, Tennessee. Graduate Instructor, Krannert School of Management, Purdue University, Indiana, January 1979 to June 1979. Lecturer in Marketing Management, College of Arts, Science, and Technology, Kingston, Jamaica, October 1973 to July 1975. President, Strategic Marketing and Planning Services, Inc., November 1977 to present. Chemical Sales Manager, Jamaica and Sales Coordinator for additives and plastic sales throughout the Caribbean - Esso Inter-America, Inc., March 1974 to November 1977. Manager, Cayman Islands, Esso Standard Oil, SA Limited, March 1975 to August 1975. Economics and Planning Advisor, Esso Standard Oil S.A. Limited, Kingston, Jamaica, March 1, 1971 to March 1974. Founder, Owner and Manager, Wooden Products and Accessories, Ltd., Kingston, Jamaica, October 1971 to January 1977. "Securing Community Buy-In to Efforts to Create a Peer Culture of Excellence Among Minority students: A Marketing Oriented Approach," accepted for the 1998 Proceedings of the Southern Marketing Association, November 1998. Hudson P. Rogers, Mohan K. Menon, 1998 Proceedings of the Association of Marketing Theory and Practice, March 1998. "Busing for Desegregation: A Marketing Dilemma," (With Madelyn Isaacs), 1995 Proceedings of the Southern Marketing Association, November 1995. "Scholars’ Club, A Culture of Achievement Among Minority Students," (With Madelyn Isaacs), The School Counselor, January 1995. "Seamless Recruitment - The opportunity for a K-Post-Secondary program with PSEP," (with Madelyn Isaacs) 1994 Proceedings of the Minority Student Today Conference, October 9-12. "An Assessment of Self-Concept and Values Variables Concerning the Importance of Education for Minority Student Success." (with Madelyn Isaacs) 1994 Proceedings of the Minority Student Today Conference, October 9-12. "Minority Education Intervention: The Experience of Two Programs with Middle School and High School Students and Their Families" (with Madelyn Isaacs), Research Bulletin, FERC, Vol. 22, No. 4, Spring 1991. "Correlates of Consumer Service Satisfaction in the Residential Real Estate Industry", 1991 Proceedings of the Southern Marketing Association, November 1991. "Physicians Say 'No' to Advertising by Physicians but 'Yes' to Advertising by Hospitals", Hospital Topics, December 1990. "Despite Personal Opposition to Advertising, Physicians Believe its 'OK' for Hospitals to Advertise", Marketing News, Vol. 24, No. 20, P. 19, October 1, 1990. "Female versus Male Real Estate Salespersons: Are They Perceived Differently by Consumers? ", 1990 Proceedings, Southern Marketing Association, November 1990. "The Impact of Foreign Exchange Deficiencies on Export Planning by Caribbean Firms", 1987 Proceedings, Southern Marketing Association, November 1987. "Nationalism and the Consumer: Is it Really Important?" 1987 Proceedings, Academy of Marketing Science, May 1987. "Strategy Studies and Entrepreneurship", with Gary Roberts and Lloyd Southern, 1987 Proceedings, Association of Private Enterprise Education, April 1987. "Research into Entrepreneurship as a Form of History", with Gary Roberts and Lloyd Southern, 1987 Proceedings, Association of Private Enterprise Education, April 1987. "Content Analysis of Business Related Papers published in RMCLAS Proceedings: 1977-1985", with Gary B. Roberts, 1987 Proceedings, Business Association for Latin American Studies, February 1987. "Comparison of Buyer, Seller, and Realtor Assessments of Realtor Characteristics", Marketing in an Environment of Change: 1986 Proceedings, Southern Marketing Association, November 1986. "Strategic and Public Policy Decisions Facing Caribbean Exporters", 1986 Proceedings, Business Association for Latin American Studies, Estes Park, Colorado. Also published in JACQ: The Jamaican-American Quarterly, Winter 1986. "The Foreign Exchange Dilemma in the Caribbean: Implications for Export Planning", 1986 Proceedings, Business Association for Latin American Studies, Estes Park, Colorado. RECIPIENT OF THE AWARD FOR "OUTSTANDING PAPER". "CEO’s and the Caribbean Export Firm", Roger Calantone (Ed), 1984 Proceedings, Mid-Atlantic Marketing Association, Orlando, Florida. "Empirical Investigation of the Effects of Foreign Exchange Shortages on Caribbean Export Perceptions", Richard E. Wokutch (Ed), 1984 Proceedings, International Council for Small Business, Chicago, Illinois. "Economic and Social Barriers to Successful Export Marketing: A Look at the Caribbean Basin Nations", Garth M. Hansen (Ed), 1984 RMCLAS Proceedings, Center for Latin American Studies, Tucson, Arizona. "Small Business, Entrepreneurial Effort, and the English Speaking Caribbean", Richard E. Wokutch (Ed), 1982 Proceedings, 27th World Congress of Small Business, International Council for Small Business, Knoxville, Tennessee. Economic Empowerment Program for Public Housing Residents, Fort Myers Housing Authority, August 1993-July 1994. STARS Program Evaluation Report - 1989-93, City of Fort Myers, Division of Parks and Recreation, August 1993. 1993-94 Evaluation Plan: STARS Program, Division of Parks and Recreation, July 1993. Economic Feasibility Analysis and Business Plan for the Dunbar Shopping Center, City of Fort Myers, Community Development Agency, February 1992. An Assessment of the Need for Management Training and Development in the English Speaking Caribbean, (with Edward L. Fenton Jr., John N. Doggett, John C. Edmunds, William E. Renforth, John I Reynolds, Eric St. Cyr and Cheri Waters), Caribbean association of Industry and Commerce, U. S. Agency for International Development, August 1985. "The Tourism Industry in Jamaica: Mass Versus Differentiated Marketing", working paper no. 105, The University of Tennessee, 1981. "Nationalism and Behavior--An Empirical Demonstration of Congruence", working paper, College of Business Administration, The University of Tennessee, Knoxville, Tennessee, November 1980. "The Jamaican Economy in the 1980's--A need for a Policy of Strategic Retreat from Reliance on Petroleum", working paper, College of Business Administration, The University of Tennessee, Knoxville, Tennessee, November 1980. Understanding Jamaica, manuscript under preparation, 1998, 193 pp. Seminal Influences: Legacies of a Jamaican-American, manuscript under preparation, 1998, 317 pp. The Cuban-Jamaican Connection (Novel), Kingston Publishers Limited, Kingston, Jamaica, 1982, 349pp. Jamaicanisms: The Jamaican Language from A to Z (a booklet on Jamaican dialect), LRMD Publications, Knoxville, Tennessee, DLM Enterprises, Kingston, Jamaica, 1983, 45pp. Training The Trainers: A Manual for Beginner Soccer Coaches, LRMD Publications, Knoxville, Tennessee, DLM Enterprises, Kingston, Jamaica, 1984, 48pp. Editor: Index - Articles published in BALAS Proceedings 1977-1987, Business Association of Latin American Studies Proceedings, 1988, 48 pages. Editor: Marketing and Small Business/Entrepreneurship: Conceptual and Research Directions, with Gerald E. Hills and David J. Barnaby, Proceedings of conference sponsored by AMA and ICSB, The University of Tennessee, 1981. "Lee County Residential Unit Occupancy Study", a project funded by a grant from the Gannett Foundation, December 1, 1986. PSEP Transitional Strategic Plan, (with Madelyn Isaacs), January 1995, USF at Fort Myers/FGCU. PSEP Strategic Business Plan: 1993-96, (with Madelyn Isaacs), January 1994, USF at Fort Myers. Over 10 other unfunded reports to private and government agencies between 1995-98. Career Prospectus Preparation Guidelines: A Personal Strategic Marketing Plan, Fall 1998. "Business Faculty Expectation from an Academic Resume: A Content Analysis," Fall 1998. "An assessment of self-concept and values variables concerning the importance of education for minority student success." (With Madelyn Isaacs), Spring 1999. "Developing a Peer Culture of Success Among Minority Students: A Creative Marketing Challenge," Twenty-third CSA Conference, May 1998. "Export Marketing Activity Among Small and Medium Size Firms from Developing Countries: An Investigation of Caribbean Firms," (With Hudson Rogers), Twenty-third CSA Conference, May 1998. "The Public Schools Enrichment Partnership: College-For-A-Day", (with Madelyn Isaacs), Florida's Conference on Improving Education, September 1993. "Scholars' Club: A Culture that Fosters Academic Accomplishment Among Minority Students", (with Madelyn Isaacs), Florida's Conference on Improving Educator, September 1993. "Strategic and Public Policy Decisions Facing Caribbean Exporters", 1986 Annual Conference of Business Association of Latin American Studies, Estes Park, Colorado. "Structural and Economic Environment: Entrepreneurial Growth in Developing Countries", 27th World Congress of Small Business, sponsored by the International Council for Small Business, Knoxville, Tennessee, June 1982. "The Art of Making Conference Presentations", with Max Wortman, University of Tennessee. A paper presented at the 27th World Congress of Small Business, sponsored by the International Council for Small Business, Knoxville, Tennessee, June 1982. "Export Marketing and the US Economy: Why, How, and With What Results", East Tennessee International Commerce Club, September 1981. "Entrepreneurial Curriculum in Business Education: A Survey of the Business Programs Offered by 83 Black Colleges and Universities", Education in Entrepreneurship Conference, Baylor University, Waco, Texas, June 1981. "Marketing Curricula: A Role for Small Business and Entrepreneurship", Marketing/Small Business Entrepreneurship Workshop, ICSB, The University of Tennessee, Knoxville, Tennessee, May 1981. "Nationalism in the Marketplace: Jamaican Consumer Source Perceptions", Eastern Regional Meeting of the Academy of International Business, New York University, New York, April 1981. Over 150 PSEP-and marketing related presentations at schools and civic organizations throughout southwest Florida each year. Developed and coordinated a series of televised Community Forums under the heading "Crisis in Minority Education" to call attention to alarming performance disparities between racial/ethnic groups enrolled in the public schools of southwest Florida (1995). Coordinator and Panelist, Education and Economic Development Tracts, Leadership Lee County, 1993. Coordinator and Panelist, Social Issues and Economic Development Tracts, Leadership Lee County, 1992. Group Facilitator, Regional Educational Executive Issues Forum, West Central Regional Management Development Network, Tampa, 1990. Keynote Speaker, "Marketing Challenges and Opportunities Facing Human Resource Professionals", Annual General Meeting, American Society of Training and Development (ASTD), April 1990. Panelist, Second Annual World Share Showcase, World Trade Council of Southwest Florida, April 1990. Keynote Speaker, "Demystifying the Export Marketing Process", First Annual World Share Showcase, World Trade Council of Southwest Florida, April 1989. Organized Clinic on Health Care Marketing in Southwest Florida, Guest Speaker, Janet Guptil, Vice-President - Marketing, The Sachs Group, Spring 1989. Panelist, Southwest Florida Regional Economic Conference, Chamber of Southwest Florida, October 1989. Presented Recognition Award to "Small Business Leader of the Year", at the Second Annual MBA Forum, Sonesta Sanibel Harbor Resort, Fort Myers, Florida, May 1989. "Management Training Needs in the Caribbean", a presentation at a symposium on the English-speaking Caribbean - FROM EMPIRE TO EDEN, University of South Florida at St. Petersburg, February 1987. Organized and hosted, "1985-86 Marketing Forums" at the University of South Florida at Fort Myers. Forums involved guest lectures by business executives. "Marketing and the Home Health Industry: An Alliance Dictated by New Economic Realities", presentation to Health Care Professionals, Redi-Care Inc., Fort Myers, Florida, February 1986. "Marketing Planning, and the Manufacturing Community", keynote address to the Lee County Manufactures' Association, Fort Myers, Florida, February 1986. "The Role of AISEC in Fostering Global Leadership and Understanding", keynote address to the 1985 Southern Regional Conference of AISEC, Fairfield Glades, Tennessee, March 1985. "Marketing and Economic Development in the Black Community", invited university presentation, Knoxville College, December 1984. "Media Must Maintain Commitment" Guest Opinion, News-Press, Sunday, May 26, 1996. "Crisis in Minority Education", Guest Opinion, News-Press, Sunday, November 25, 1995. "Disadvantaged Business Council’s assignment a painstaking process", Guest Opinion, News-Press, Sunday, June 11, 1995. "Some Lee County Students To Go To School on Wheels" (with Madelyn Isaacs), Insight, News-Press, Sunday, May 22, 1994. "Buses Could Become Centers of Learning Instead of Controversy" (with Madelyn Isaacs), Guest Opinion, News-Press, Sunday, February 14, 1993. Results of Lee County Occupancy Survey were published in both the Fort Myers News-Press, Sunday, March 15, 1987 - "Study Tracks Elusive Tourists", and University of South Florida, Close-up - special Research Issue, "It's Always the Season to visit Fort Myers", No. 2, page 10C, 1987. "Reconstruction of the Jamaican Economy--Export and Managerial Barriers", Public Affairs, Jamaica Daily Gleaner, October 1981; Jamaica Weekly Gleaner--North American Edition, November 1981; Jamaica Weekly Gleaner--European Edition, November 1981. Founder and publisher of PSEP News, a bi-annual newsletter to the business and donor communities of southwest Florida, 1994-present (see attachment). Principal Researcher, Publisher, Southwest Florida Business Outlook, October 1992. "Survival in the 1990's," Florida Business Southwest, December 1989. "Management Education and Training Needs in Jamaica" JACQ, Fall/Winter 1986-87. Over 25 live appearances between 1996-98. Sample video of interviews will be provided on request. Founded the PSEP Research Council which during its first year, 1998-99 will award faculty research grants totaling $10,000. PSEP serves as an umbrella for several public school based programs whose aims are to enhance achievement and attainment of opportunities for minority and disadvantaged students in Southwest Florida. Principal programs are College-For-A-Day and Scholars' Club. CFAD is a program which brings elementary and middle school students and their parents to the University of South Florida, Fort Myers Campus for a four-hour program designed to demystify the higher education process. University visits are scheduled weekly throughout the academic year, and are targeted to "at risk" public school students from Lee, Hendry, Glades, Collier and Charlotte Counties. Outstanding Program for Performance and Enhancement of Affirmative Action in Higher Education" University of South Florida, 1990. Scholars’ Club is the premier academic organization for minority and "at risk" students in Southwest Florida. The principal objective is to promote and support attainment of a peer culture of success among students. As of Fall 1998, there were 57 Chapters of the Scholars’ Club in Lee, Charlotte, Collier, Hendry and Glades Counties in southwest Florida. Other Florida chapters exist in Sarasota, Palm Beach and Hillsborough Counties. Outside of the state of Florida, Chapters exist in New York, Pennsylvania, Iowa, Kansas and Washington. PSEP is largely funded by contributions from the community. Contributions from the University are minimal, involving only utilities, office space and some equipment support (e.g. computer). the race and ethnic based performance disparities in the school system result from local conditions and should be addressed locally. Thus, there has been minimal efforts to secure national or state funding. when the need for programs such as PSEP no longer exists, the community will cease to fund the program. Overall, since 1993, PSEP has been budgeted at ($499,650). 1994-95: College Reach Out Program, $42,500. This grant, was used to fund a special program for 7-12 grade students who are not currently members of Scholars" Club, and most of whose GPA is below 2.5. 1994-95: Mobile Magnet Transportation Pilot Program: $7,500 Gannett Foundation grant obtained to pilot and evaluate educational enrichment on school buses. Grant obtained for School District of Lee County. 1987-88: Development of a Consortium of Business and Higher Education, $78,000, PEPSI Foundation. USF - Fort Myers, Chairman, Faculty Council, 1993-94. USF - Fort Myers, Member, Search Committees for Accounting, Management, Psychology and Accounting and Education Leadership, 1992-93. USF - Fort Myers; Search Committee, Management Professor, Spring 1991. USF - Sarasota; Member, Search Committee, for Accounting, Spring 1991. USF - Fort Myers; Member, Search Committee for Endowed Chair of Nursing Candidate, Summer-Fall 1990. USF - Fort Myers; Member, Selection Committee for Associate Dean, Spring 1990. Member, Board of Directors, NationsBank, 1998- present. Member, Board of Directors, Barnett Bank of Lee County, 1995-1997. Member, Advisory Council, Southwest Florida Regional Medical Center, 1991- present. Member, IRB Board, Southwest Florida Regional Medical Center, 1992 - present. Member, Steering Committee, Leadership Lee County, 1992-93. Member, Lee County Disadvantaged Business Enterprise Council, 1991-92. Member, Curriculum and Instruction Committee to develop long-range strategic plan, The School Board of Lee County, 1992 - 93. Founder & Chairman, Board of Directors, Dunbar Chamber of Commerce, 1991 - 1997. Member, Board of Directors, Edison Pageant of Light, 1991-1995. Member, Board of Directors, United Way of Lee County, 1990 - present. Generate over 100 paid Summer Internship Opportunities each year for Scholars’ Club students enrolled in the public school systems of southwest Florida (see attachment). In Summer 1996, 129 opportunities, generating over $300,000 of summer compensation was facilitated. Vice-President - Government, United States Association for Small Business and Entrepreneurship, 1987-88. Charter Participant - Leadership Lee County Seminar Series, Lee County, Florida, 1986. Co-Chair - 27th World Congress for Small Business, Knoxville, Tennessee, June 1982. Faculty Representative and Panel Member - 12th Annual Albert Herring Symposium, Indiana University, March 1982. Distinguished Community Service Award, 1998, Florida Board of Regents. Recipient of special award for "Outstanding Service to Youth in the Community," Quality Life Center, 1994. Selected by the University of South Florida as the Ida Baker Distinguished Minority Educator, (1991, 1993). Recipient of the award for Outstanding Paper, ("The Foreign Exchange Dilemma in the Caribbean: Implications for Export Planning"), Business Association for Latin American Studies, Estes Park, Colorado, 1986. Selected as the Best Lee County Youth Soccer Referee, 1992, 1993. Recognized by the University of Tennessee, Knoxville, as a "Tennessee Olympian" for being the winning coach of a gold medal Tennessee select soccer team at the 1984 McDonald’s Youth Soccer Olympics. I was born in Vancouver, B.C., Canada in 1927. My father owned and ran the Duffus Business College. Having fought the encroaching government involvement in that business for decades, my father did not encourage me to continue it, although I went through all its courses at an early age, and even taught a little. After winning a provincial scholarship to the University of British Columbia I embarked on the engineering program during the final years of World War II. At first I headed towards aeronautical engineering, but I found large numbers of aeronautical engineers unemployed in Los Angeles. Therefore, l changed to Physics on the recommendation of my professor who correctly advised me that one would never make any money at it, but physics was fun. Several of us decided to ask the university to start an Engineering Physics program. We had no trouble in getting the faculty to do so...and without the strikes and sit-ins which later characterized student/faculty negotiations with the same faculty as in our day. So we formed the first class to graduate in Engineering Physics in 1948. Engineering aside, I spent a great deal of time in amateur dramatics, becoming president of the Players' Club and playing very minor roles on stage with a surprising number of people who later became professional actors. During the summer of 1948 I worked at the Suffield Experimental Station in Alberta for the Defence Research Board on field trials with nerve gas countermeasures. I learned the valuable lesson that nobody was looking after me anymore when, after a nerve gas bomb drop, I found my gas mask leaked. After a memorably bumpy small aircraft ride across the prairies following a much too boozy bachelor party, I reached Victoria and shortly afterwards married my wife of forty eight years, Maureen Stuart Yates. Many particulars of her family's long association with Victoria are to be found in her historical novel "A Most Unusual Colony" ISBN 1895332-1 1-7. We honeymooned in Quebec City and took up my first teaching job at the fledgling Carleton College in Ottawa. At that time it was a rather hand-to-mouth establishment. Each summer the staff waited for the announcement of the Provincial Government's financial grant to learn if they still had jobs. Some of them didn't. Now it is the well known and well established Carleton University. During the summers I attended the Graduate School of Physics at Columbia University in New York. One summer I worked at the National Research Council Laboratory in Ottawa perfecting a method to make artificial sapphire and ruby. During the winter I also took extension graduate courses from McGill University, Montreal, in Electrical Engineering. Maureen had continued her career as a journalist by getting a job with the Ottawa Citizen newspaper. However, she had inherited some money in England which could not be taken out of the country. When the Dean of Arts at Carleton got me into New College, Oxford, and the National Research Council came up with a scholarship, there was little point in finishing at McGill or Columbia. I quit my job at Carleton, and we took the Empress of Scotland across the rather rough Atlantic, spending the next three years in Oxford...a very happy choice. At the Clarendon Laboratory I worked on solid state microwave spectroscopy using the recent wartime advances in radar equipment and the special low temperatures and large magnetic fields available at that laboratory. We did not know it at the time, but this area of research led soon afterwards to the invention of masers and lasers. After graduating with a degree of D.Phil. I looked for a job in Canada. The Defence Research Board was growing at that time, and offered a job at Suffield. However I held out for a job at the new Pacific Naval Laboratory in Victoria...then a collection of army huts. For the next five years I was engaged in submarine detection methods. As submarines had become capable of standing off the coast and firing nuclear missiles, our job was to develop long range acoustic tracking capability and short range magnetic detection methods to identify the target precisely for attack by ship or aircraft. The magnetic detection problems led us to a fascinating area of study of the ionosphere, the auroral regions, and the emissions from the sun. Sputnik and other satellites had just gone up, and the electromagnetic properties of space around the earth were of great interest. Our secret acoustic detection equipment provided an advantage in electronics which made our research results of world class interest. After five years at the Pacific Naval Laboratory I was offered the job of Professor of Physics and Head of the Department at Royal Roads Military College. I enjoyed the return to teaching and the challenge of finding synergies between the Defense Research Board interests and those of the Army, Navy and Airforce who were our supporters. Thus a good deal of surplus Defence Research Board scientific equipment found its way into Royal Roads teaching and research laboratories. We were not constrained by aircraft or ship costs to do experiments quickly, nor to use the absolutely newest state of the art equipment. Maureen continued her career in journalism at both Victoria daily newspapers, rising to Editor of the Women's Section. Later she produced the public relations newsletters for the Institute of Ocean Sciences, at Pat Bay, north of Victoria. In 1966 I spent a sabbatical year at Oxford and at ['Institute de Geophysique at the Universite de Paris, mostly at their Laboratoire Geodynamique Soumarin in Villefranche sur Mer. As the Russians had just offered them support for underwater geomagnetic research and hence the Americans had pulled out, this was not a very good time to get much work done. In 1976 I was sent to the National Defence College, Kingston, for their year long orientation program about world politics and economics. This involved many months of travel, lectures and briefings in the company of about forty upwardly mobile military officers, senior civil servants, university professors and business people. It was a remarkable experience. During my years as Dean of Science and Engineering, including a few as Acting Principal, Royal Roads Military College grew from a three year undergraduate feeder college to a college with bachelors degrees in science and arts and masters degrees in science. We pioneered many advanced courses in underwater acoustics and oceanography based upon the existing and foreseen requirements of the armed forces. I retired in 1989. In 1995 the government closed both Royal Roads Military College and the National Defence College as an economy measure. No comment. Since retirement I have started the Victoria branch of the Tetra Society. Their volunteers invent, design, or adapt aids for handicapped people which are not available commercially. 1966 - 1969 University of Liverpool, Department of Veterinary Pathology. New Equine Diagnostic Centre (serving the south west, Wales and central England). Extensive computerisation and networking of site. I have been responsible for heading-up all these projects and developments including the initial planning, production of detailed business plans, securing funding, selection of contractors etc. Current annual salary is £43,442 together with the British Universities contributory superannuation scheme (USS). My ten year period of work at Cambridge Veterinary School combined a research and teaching career as a lecturer, a College career as Official Fellow and Senior Tutor and in the last few years a management career as Deputy Head of Cambridge Veterinary School. My research group included both overseas post graduate students and experimental work on diseases found in East and Central Africa (eg East Coast Fever and Trypanosomiasis). My position as Senior Tutor gave me the major responsibility for the selection, processing and overseeing of all the post graduate students, the majority of whom were from overseas. I left Cambridge University on appointment to a Chair at Bristol University. This was a three year full-time research post taken up after my initial return from the six years work in East Africa. The work was funded by the Wellcome Trust and Agricultural Research Council. I left to take up a tenured position within Cambridge University. For the first three years in Kenya I was employed by the FAO of the United Nations as team leader in immunology within a project investigating the prevalence of tick-borne diseases within Kenya. The work also involved training of both professional and support staff including training abroad for a number of Kenyan staff. The following three years of work funded by the British Government concentrated on developing the immunology laboratory at the Veterinary Research Centre and establishing a number of diagnostic tests etc. for use in the field and laboratory. I left this job to return to an academic career in Britain. An applied course given to veterinary students after their basic immunology course in the Medical Science Tripos. A course given to veterinary students before they begin their species medicine courses, and intended to introduce the concepts of epidemiology and disease control. Lectures forming part of the combined cattle course. Subjects covered include all neonatal calf diseases, enzootic calf pneumonia, salmenellosis, respiratory disease in adults, gastro-intestinal diseases in adults and fluid therapy. A short course given to pre-clinical veterinary, medical and natural science students. Small group teaching in clinical examination, preventative medicine, the use and application of computer-based (eg Daisy) programmes and immune-mediated diseases. Assessor, Examiner and Chairman of Examiners for all medical subjects in the Final Veterinary Examination at the University of Cambridge and Bristol. I have personally supervised 12 PhD students comprising individuals from both both home and overseas (including one from Kenya). I have also examined several PhD dissertations for the Universities of Bristol, Cambridge, Edinburgh, Liverpool, Glasgow and London. This includes studying the eosinophil-mediated antibody-dependent destruction of parasites; the isotype and sub-isotype of antibody responsible; the influence of mediators such as ECF-A and interleukins; the characterisation and biological activity of granule contents from eosinophils and neutrophils, especially cationic proteins; and purification of surface antigens from the parasites both to provide sensitive and specific serological assays, as well as possible immunogens for vaccination. This includes working on viruses such as BHV1, PI3 and RSV; producing highly sensitive ELISA tests for each virus; examining the potential of calf leucocytes to destroy virus infected targets in both antibody-dependent (ADCC) and antibody-independent (CTL and NK) assays; and producing a sensitive and reliable 3H-uridine incorporation assay for bovine interferon (IFN). These recombinant lymphokines and monokines are assessed in vitro for their effect on the recruitment and activation of bovine NK cells. Experiments are also done on delivery systems in vivo to induce high levels of anti-viral activity in the upper and lower respiratory system of calves following inhalation of an aerosol of IFNa. Some of this work has involved the study of individual field cases and outbreaks in an effort to bridge the gap between laboratory based research, the actual disease problem itself and the needs (diagnostic and therapeutic) of the clinicians. A major part of the research effort of my group was in the area of producing SPF (EHV1 free) foals and establishing a totally susceptible equine model for EHV1 infection. Various recombinant and purified glycoprotein preparations tested by various routes for their potential as candidate vaccines. In addition, the IFN response and isotype and sub-isotype antibody response in serum and nasal mucous in response to EHV1 infection was studied. At the cellular level specific T cell transformation, NK activity and neutrophil-mediated antibody-dependent cytotoxicity (ADCC) were also studied. All these parameters are included in a battery of assays in an additional study on the development of immune competence in the neonatal foal. A panel of monoclonal antibodies (Mabs) have been made against canine lymphocytes and a retrovirus-infected canine lymphoid cell line. In addition the canine NK cell assay has been established using the latter target, and was studied in a series of clinical tumour cases. A panel of Mabs has also been recently made against canine IgG sub-isotypes. In addition another panel of Mabs has been produced against equine lymphocytes and equine immunoglobulins. Techniques have been evolved to hyperimmunize cattle against selected pathogens from both domestic animal and human diseases. Assays have been developed to quantify the specific immunoglobulin content of the colostral preparations as well as assessing the anti-pathogen activity of the samples in patients (eg in AIDS patients suffering from cryptosporidial infection). This link programme studied the role and fate of the large population of null T lymphocytes in the young pig. This work was firstly on their potential differentiation pathways using a combination of Mabs and cDNA probes; secondly on their functional role in assays such as NK cell killing; thirdly on their origins, phenotypic changes and migration in vivo. A molecular biological approach to developing an innovative approach to vaccination of cattle involving a recombinant herpes viral vector with insertion sites for both bovine cytokine genes as well as individual pathogen genes. ALLAN, D, DUFFUS, W.P.H. and HIGGINS, D.A. ( 1968) Measurement of antigen-antibody complexes in Salmonella gallinarum infection.Immunology 14, 575. DUFFUS, W.P.H. and ALLAN, D. (1968) A study of the immunological response in chickens to the somatic antigen of Salmonella galllinarum. Immunology 15, 653. DUFFUS, W.P.H. and ALLAN, D. (1969) A study of the ontogeny of specific immune responsiveness amongst circulating leucocytes in the chicken. Immunology 16, 337. DUFFUS, W.P.H. and ALLAN, D. (1971) The kinetics and morphology of the rosette-forming cell response in the popliteal lymph nodes of rats. Immunology 20, 345. ALLAN, D., ELSON, J., DUFFUS, W.P.H. and JAMES, K. (1971) The loss of the immunosuppressive properties of antilymphocyte globulin following absorption with immunizing antigen (SRBC) Clinical and Experimental Immunology 8, 101. ALLAN, D. and DUFFUS, W.P.H. (1971) The immunopathology in fowls (Gallus domesticus) of acute and subacute Salmonella gallinarum infection. Research in Veterinary Science 12, 140. TAYLOR, R.B., DUFFUS, W.P.H., RAFF, M.C. and DE PETRIS, S. (1971) Redistribution and pinocytosis of lymphocyte surface immunoglobulin molecules induced by anti-immunoglobulin antibody. Nature 233, 225. ELSON, C.J., ALLAN, D., ELSON, J. and DUFFUS, W.P.H. (1972) The relationship between the morphology of rosette-forming cells and their mode of rosette formation. Immunology 22, 291. DUFFUS, W.P.H. and WAGNER, G.G. (1974) The specific immune response in the lymph nodes of cattle undergoing Theileria parva infection, as determined by the rosette test. Parasitic Zoonoses, Clinical and Experimental Studies (ed. by E.J.L. Soulsby), p. 85, Academic Press, New York. WAGNER, G.G. and DUFFUS W.P.H. (1974) Anti-lymphocyte antibody responses in cattle after inoculation with Theileria parva infected lymphoblastoid cell lines. Parasitic Zoonoses, Clinical and Experimental Studies (ed. by E.J.L. Soulsby), p.97, Academic Press, New York. DUFFUS, W.P.H. and WAGNER, G.G. (1974) Immunoglobulin response in cattle immunised with Theileria parva stabilate. Parasitology 69, 31. WAGNER, G.G., DUFFUS, W.P.H. and BURRIDGE, M.J. (1974) Immunoglobulin response in cattle to Theileria parva antigens. Parasitology 69, 43. WAGNER, G.G., BROWN, C.G.D., DUFFUS, W.P.H., KIMBER, C.D., CRAWFORD, J.G. and LULE, M. (1974) Immunochemical studies on East Coast Fever. Partial segregation and characterisation of Theileria parva schizont antigen. Journal of Parasitology 60, 848. DUFFUS, W.P.H., WAGNER, G.G. and KIMBER, C.D. (1974) Immunochemical studies on East Coast Fever. Development of an indirect haemagglutination assay using Theileria parva piroplasm antigen. Journal of Parasitology 60, 860. WAGNER, G.G., DUFFUS, W.P.H., KIMBER, D.C. and LULE, M. (1974) Immunochemical studies on East Coast Fever. Partial segregation and characterization of Theileria parva piroplasm antigen. Journal of Parasitology 60, 854. WAGNER, G.G., DUFFUS, W.P.H., AKWABI, C., BURRIDGE, M.J. and LULE, M.(1975) The specific immunoglobulin response in cattle to Theileria parva (Muguga) infection. Parasitology 70, 95. DUFFUS, W.P.H., PRESTON, J.M. and STAAK, C.H. (1975) Initial fractionation of adult Schistosoma bovis antigen for diagnosis of infection in cattle. Journal of Helminthology 49, 1. PRESTON, J.M. and DUFFUS, W.P.H. (1975) Diagnosis of Schistosoma bovis infection in cattle by an indirect haemagglutination test. Journal of Helminthology 49, 9. NEWSON, R.M., DUFFUS, W.P.H. and KILTZ, H. (1975) East Coast Fever: Cross-immunity trials. Food and Agriculture Organisation of the United Nations, Rome. DUFFUS, W.P.H. (1975) Some aspects of the immunology of tick-borne cattle diseases in Kenya. Food and Agricultural Organisation of the United Nations, Rome. DUFFUS, W.P.H., NEWSON, R.M. and KILTZ, H. (1975) An epizootiological survey of tick-borne cattle diseases in Kenya. Food and Agricultural Organisation of the United Nations, Rome. DUFFUS, W.P.H., BUTTERWORTH, A.E.B., WAGNER, G.G., PRESTON, J.M. and FRANKS, D. (1978) Antibody-dependent cell-mediated cytotoxicity in cattle. Activity against 51Cr labelled chicken erythrocytes coated with protozoal antigen. Infection and Immunity 22, 492. DUFFUS W.P.H., WAGNER, G.G. and PRESTON, J.M. (1978) Initial studies on the properties of a bovine lymphoid cell culture line infected with Theileria parva. Clinical and Experimental Immunol. 34, 347. DUFFUS, W.P.H. and WAGNER, G.G. (1980) Comparison between certain serological tests for diagnosis of East Coast Fever. Veterinary Parasitol. 6, 313. DUFFUS, W.P.H. and FRANKS, D. (1980) In vitro effect of immune serum and bovine granulocytes on juvenile Fasciola hepatica. Clinical and Experimental Immunol. 41, 430. DUFFUS, W.P.H. and FRANKS, D. (1981) The interaction in vitro between bovine immunoglobulin and juvenile Fasciola hepatica. Parasitology 82, 1. TOWNSEND, J.A. and DUFFUS, W.P.H. (1982) Trypanosoma theileri: antibody-dependent killing by purified populations of bovine leucocytes. Clinical and Experimental Immunol. 48, 289. TOWNSEND, J.A., DUFFUS, W.P.H. and GLAUERT, A.M. (1982) An ultra-structural study of the interaction in vitro between Trypanosoma theileri and bovine leucocytes. J. Cell Science 56, 389. TOWNSEND, J.A., DUFFUS, W.P.H. and LAMMAS, D.A. (1982). The importance of competitive binding in the detection of antigen-specific bovine isotypes and sub-isotypes by the micro-ELISA. Research Veterinary Science 33, 319. LAMMAS, D.A. and DUFFUS, W.P.H. (1982) The use of the ELISA to detect antigen release from juvenile Fasciola hepatica. Current Topics in Veterinary Medicine and Animal Science 22, 52. DUFFUS W.P.H. (1982) Applications of the enzyme linked immuno-adsorbant assay (ELISA) in veterinary protozoology. Current Topics in Veterinary Medicine and Animal Science 22, 72. LAMMAS, D.A. and DUFFUS, W.P.H. (1983) The shedding of the outer glycocalyx of juvenile Fasciola hepatica. Veterinary Parasitology 12, 165. DUFFUS, W.P.H. (1983) Steptococcal meningitis in pigs: the immune response and its implications for diagnosis and possible vaccination. In: Some Diseases of Emerging Importance to Community Trade. Eds. J.R. Walton, E.G. White and S.A. Hall. European Communities Commission, Luxemburg. THORNE, K.J.I., NORMAN, J.N., HAYDOCK, S.F., LAMMAS, D.A. and DUFFUS, W.P.H. (1984) Antibody-dependent cell-mediated cytotoxicity against IBR-infected bovine kidney cells by ruminant and human neutrophils: the role of lysosomal cationic protein. Immunology 53, 275. DUFFUS, W.P.H. (1984) Isotope-based immunological techniques: their use in assessment of immune competence and the study of immune responses to pathogens. In: Nuclear techniques in tropical animal diseases and nutritional disorders. Ed. I.A.E.A. Vienna. CLIFTON-HADLEY, F.A., ALEXANDER, T.J.L., UPTON, I. and DUFFUS, W.P.H. (1984) Further studies on the subclinical carrier state of Streptococcus suis type 2 in pigs. Veterinary Record 114, 513. WARDLEY, R.C. and DUFFUS, W.P.H. (1984) The role of immunity in virus infections. Development of the immune response, influence of both host and virus. In: Cell Mediated Immunity p. 312, Ed. P.J.Quinn. European Communities Commission, Luxemburg. DUFFUS, W.P.H. and WARDLEY, R.C. (1984) Cell-mediated immunity in viral diseases: effector mechanisms. In: Cell Mediated Immunity p. 320, Ed. P.J.Quinn. European Communities Commission, Luxemburg. LAMMAS, D.A., DUFFUS, W.P.H. and TAYLOR, D.W. (1985) Identification of surface proteins of juvenile stages of Fasciola hepatica. Research Veterinary Science 38, 248. TOWNSEND, J.A. and DUFFUS, W.P.H. (1985) Antibody-dependent cellular cytotoxicity of Trypanosoma theileri by purified bovine isotypes and sub-isotypes. Parasite Immunology 7, 179. GLAUERT, A.M., LAMMAS, D.A. and DUFFUS, W.P.H. (1985) Ultrastructural observations on the interaction in vitro between bovine eosinophils and juvenile Fasciola hepatica. Parasitology 91, 459. O'BRIEN, J.K. and DUFFUS, W.P.H. (1986) Pasteurella haemolytica cytotoxin: susceptibility of bovine leucocytes. Veterinary Microbiology 13, 321. O'BRIEN, J.K. and DUFFUS, W.P.H. (1987) Neutralization of Pasteurella haemolytica leucotoxin by bovine immunoglobulins British Veterinary J. 143, 439. TOWNSEND, A.J., DUFFUS, W.P.H. and WILLIAMS, D.J.L. (1988) Immune production of interferon by cultured peripheral blood mononuclear cells from calves infected with BHV1 and PI3 viruses. Research Veterinary Science 45, 198. TOWNSEND, A.J., DUFFUS, W.P.H. and WILLIAMS, D.J.L. (1988) The effect of age of cattle on the in vitro production of interferon by peripheral blood mononuclear cells. J. Comparative Pathology 99, 169. DUFFUS, W.P.H. (1988) Immunity to Infection. In Veterinary Clinical Immunology, p. 135. Eds. R.E.W. Halliwell and N.T. Gorman. W.B. Saunders, London. DUFFUS, W.P.H. (1988) Immunoprophylaxis. In Veterinary Clinical Immunology, p. 205. Eds. R.E.W. Halliwell and N.T. Gorman. W.B. Saunders, London. Petrovskis, E.A., Duffus, W.P.H., Thomsen, D.R., Meyer, and Post L.E. (1988) Sequence of pseudorabies virus and infectious bovine rhinotracheitis virus glycoprotein H genes. 13th Int. Herpesvirus Workshop, p. 217. Holmes, M., Duffus, W.P.H. and Gorman, N.T. (1989) Natural cytotoxicity in the dog: description of two new allogeneic tumour targets. Veterinary Immunology and Immunopathology 23, 122. Holmes, M., Duffus, W.P.H. and Gorman, N.T. (1989) Monoclonal antibodies identifying cell surface proteins on a canine lymphoma cell-line. Veterinary Immunology and Immunopathology. DUNCAN, I.A. BINNS,R.M.and DUFFUS W.P.H. (1989) The null T cell in pig blood is not an NK cell. Immunology 68, 392. O'BRIEN, M.A. and DUFFUS W.P.H. (1990) The effects of Dexamethasone, Betamethasone, Flunixin and Phenylbutazone on bovine natural killer cell cytotoxicity. Veterinary Pharmocology and Therapeutics 13, 292. O'BRIEN, M.A., HOLMES, M.A. LUNN, D.P.and DUFFUS, W.P.H. (1991) Evidence for MHC class-I restricted cytotoxicity in the one-way primary mixed lymphocyte reaction. Equine Vet. J. 12, 30. MEYER, A.L., PETROVSKIS, E.A., DUFFUS, W.P.H. et al (1991) Cloning and sequence of an infectious bovine rhinotracheitis virus (BHV1) gene homologous to glycoprotein H of herpes simplex virus. Biochimica et Biophysica Acta 1090, 267. LUNN, D.P., HOLMES, M.A. GIBSON, J, FIELD, H.J., KYDD, J.H. and DUFFUS, W.P.H. (1991) Haematological changes and equine lymphocyte subpopulation kinetics during primary infection and attemped re-infection of specific pathogen free foals with EHV-1. Equine Vet. J. 12, 35. DUFFUS, W.P.H. (1992) Immunological Fundamentals. In Bovine Medicine ed. A.H. Andrews. Blackwell Scientific Publications. p797. CHONG, Y.C. and DUFFUS, W.P.H. (1992) Immune responses of specific pathogen free foals to EHV-1 infection. Veterinary Microbiology 32, 215. CHONG, Y.C., DUFFUS, W.P.H. and HANNANT, D. (1992) Natural killer cells in normal horses and specific pathogen free foals infected with equine herpesvirus. Veterinary Immunology and Immunopathology 33, 103. BINNS, R.M., LICENCE, S.T., WOODING, F.B.P. and DUFFUS, W.P.H. (1992) Active lymphocyte traffic induced in the periphery by cytokines and phytohemagglutinin: three different mechanisms? Eur. J. Immunol. 22, 2195. O'BRIEN, M.A., HOLMES, M.A. and DUFFUS, W.P.H. (1992) In vitro production of specific antibody by equine peripheral blood mononuclear cells using tetanus toxoid as a recall antigen. Res. Vet. Science 53, 184. LUNN, D.P., HOLMES, M.A. and DUFFUS, W.P.H. (1992) Three monoclonal antibodies identifying antigens on all equine T lymphocytes, and two mutually exclusive T-lymphocyte subsets. Immunology 74, 251. MAZZA, G., DUFFUS, W.P.H., ELSON, C.J. et al (1993) The separation and identification by monoclonal antibodies of dog IgG subclasses. J. Immunol. Methods 161, 193. LUNN, D.P., HOLMES, M.A. and DUFFUS, W.P.H. (1993) Equine T lymphocyte MHC class-II expression: variation with age and subset. Veterinary Immunology and Immunopathology 35, 225. MAZZA, G., WHITING, A.H., DAY, M.J. and DUFFUS, W.P.H. (1994) Development of an ELISA for the detection of IgG subclasses in the serum of normal and diseased dogs. Res. Vet. Science 57, 133. MAZZA, G., WHITING, A.H., DAY, M.J. and DUFFUS, W.P.H. (1994) Preparation of monoclonal antibodies specific for the subclasses of canine IgG. Res. Vet. Science 57, 140. FOSTER, A.P., DUFFUS, W.P.H., SHAW, S.E. and GRUFFYDD-JONES, T.J. (1995) Studies on the isolation and characterisation of a reaginic antibody in the cat. Res. Vet. Science 58, 70. Over 35 papers have been presented on research findings mostly to immunology and parasitology meetings. 1983 - 1987 Scientific Editor Veterinary Immunology and Immunopathology. 1984 - present Scientific Editor Research in Veterinary Science. In addition I regularly referee for several other scientific journals.